Looking for a deal on the Chromecast? 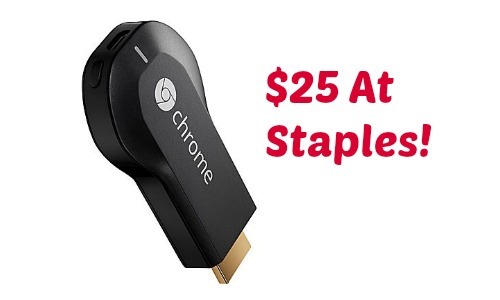 Staples is offering the Google Chromecast Wireless HDMI Streaming media player for $25. This is a $10 savings, but you will have to pick up in-store. They are out of stock online but you can click the “Pick Up Today” button and reserve to pick up at the closest location. This device allows you to cast your favorite entertainment from your phone or tablet straight to the TV. This includes casting Netflix and other services too! Offer valid for a limited time. Must pick up in-store to get deal.